Smiling because it feels good to work in a place like Granny Nannies and to find opportunities to help others. Granny Nannies cares about our clients and our communities. It’s important to our Florida-based company to find meaningful opportunities to connect with other business and citizens in our community. 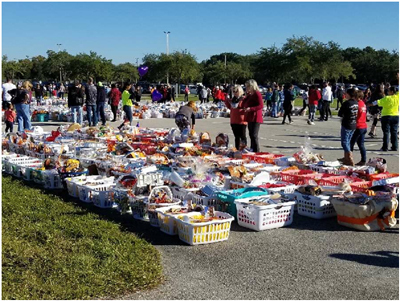 Granny Nannies enjoys participating in putting together baskets for the Thanksgiving Basket Brigade of Central Florida. The 2018 goal for the 21st Annual Thanksgiving Basket Brigade was to gather 2500 baskets for families in need, and Granny Nannies was delighted to help reach this number. This is just one way that Granny Nanny does corporate team-bonding. We worked together to fill the basket with the supplies requested by the Basket Brigade (www.basketbrigadeflorida.com). 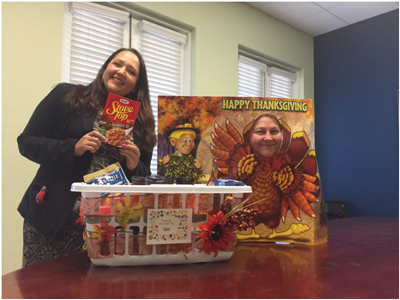 We contributed supplies like canned corn, canned cranberry sauce, stuffing, rolls, pre-made pumpkin pie, desserts, peanut butter and jelly, mac and cheese and a $10 gift card to put towards a turkey. The drop off zone for the 2018 Thanksgiving Basket Brigade that Granny Nannies participated in. We were in good company! We had fun with the Basket Brigade tradition of decorating the baskets in a holiday fashion and bringing them to the designated drop-off location, so we could socialize with other participants in our community. Giving back to the community is very important to Granny Nannies, as it fuels us with positivity to bring the best care to our clients. We are thankful for our community in Central Florida, and to all the other neighborhoods that our offices are part of. Additionally, we are thankful to our clients who rely on us for all sorts of in-home services, such as stroke or post-surgical care. Finally, we are thankful for our caregivers—the certified, experienced, and compassionate professionals we take the time to match with the right clients. We hope you and your family, friends, and communities have a terrific Thanksgiving this year.